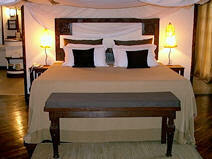 The Palms is a luxury resort situated along an unspoiled white beach on the East Coast of Zanzibar. 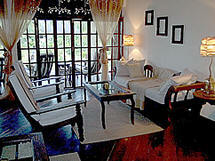 It is the island’s only boutique hotel and offers the facilities of a five star private resort. 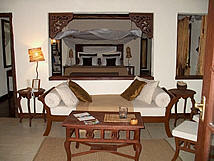 The hotel is family owned and the hosts have thought of everything to make their guests’ stay exceptional. The Palm offers six massive villas each with all the creature comforts one could ask for, the rooms are fully air-conditioned and so well equipped, one could really spend an entire holiday indoors. The accommodation at The Palms consist of 6 huge luxury villas (140 m² plus!). Each villa is fully air-conditioned and has a master bedroom, full en-suite bathroom, walk-in changing room, extra room with en-suite bathroom and large furnished terrace with a view of the ocean. Local architecture, combined with elegant, yet relaxed décor makes for a warm and stylish island setting. To add to all this every room has a private beach Banda with a thatched roof, mattress and sun beds – ideal for a quiet afternoon on the beach wit h the wind in your hair. We could live like this! The resort has its own spa, The Palms Sanctuary (the first on Zanzibar) which offers a variety of treatments to counter the negative effects of modern living, the nearby sister facility, the Frangipani Spa will be more than happy to accommodate you. Sports and water sports facilities, activities such as tennis, windsurfing, snorkelling, scuba diving, and even shopping for antiques, souvenirs and African arts & crafts is offered at Breezes, the sister resort. The Palms is Zanzibar at its best and we highly recommend it to anyone in search of a healthy combination of relaxation, comfort and luxury. The Sanctuary Spa: offering a variety of treatments and therapies of western and exotic oriental descent.